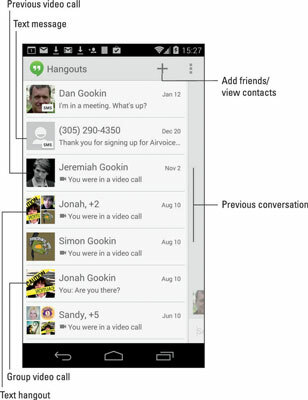 To sate your video chat desires, your Android phone comes with an app called Hangouts. It’s a communications app, designed by Google to let you connect with one or more of your friends for text and video chat. The Hangouts app might also serve as your phone’s text messaging app. The Hangouts app is a reincarnation of the old Google Talk app. The Hangouts app might appear as a launcher icon on the Home screen; otherwise, you can dig it up in the apps drawer. If you don’t see it directly in the list of apps, look for it inside a Google folder. And if you still can’t find it, you can obtain the app free from the Google Play Store. Hangouts hooks into your Google account. If you have any previous conversations, they’re listed on the main part of the screen. On the right side of the screen you see a specific conversation, although it just peeks in when the phone is held vertically. The Hangouts app listens for incoming conversation requests, or you can start your own. You’re alerted via notification of an impending Hangout request. The notification icon is shown here. Conversations are archived in the Hangouts app. To peruse a previous text chat, choose it from the list. Part of the previous chat shows up on the right side of the screen. Text messages appear in the archive with the SMS flag. Video calls aren’t archived, but you can review when the call took place and with whom by choosing a video chat item. To remove a previous conversation, long-press it. Touch the Trash icon that appears on the contextual action bar atop the screen. You can also swipe a conversation left or right to remove it. To use Hangouts, your friends must have a Google account. They can be using a computer or mobile device; it doesn’t matter which. But they must have a camera available to enable video chat.